Step One of joining the A Star Is Born fandom: Go see the movie in theaters, then immediately check when you can see it in theaters again. Step Two: Earnestly attempt Lady Gaga's elongated "ah-ha-ha" in "Shallow." Step Three: Absorb all available Star Is Born facts, with which you will pelt your friends long after their patience expires. That's where we come in. When falling in love with a movie, you want to know everything about it. Luckily, the creation of A Star Is Born — the fourth version of A Star Is Born, in fact – is full of lore and connection to past iterations, meaning that you could easily spend hours on the internet and not find them all. To jumpstart your journey, we've gathered some of the best trivia from the movie right here. Let's crash through the surface of A Star Is Born. They can't hurt us here. No matter what happens on Oscars night — whether A Star Is Born receives any awards for its many nominations or not – we'll always remember Ally and Jackson this way. 1. Bradley Cooper originally wanted to cast Jack White in the role of Jackson Maine. Sources confirmed that that person was Jack White, the former frontman of the White Stripes. 2. That iconic line? 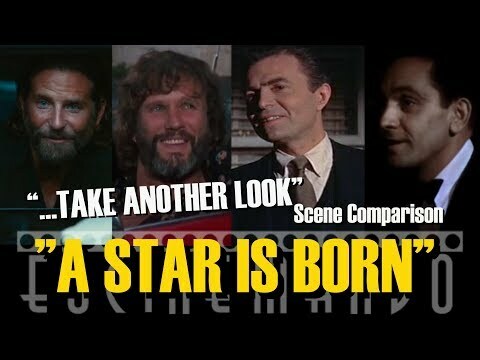 It's in all the past versions of A Star Is Born. Scene: A residential street in Los Angeles. A man rolls down a car window. He says, "Hey." The woman turns around and asks, "What?" Then, the man utters the line: "I just wanted to take another look at you." When the scene first came out in A Star Is Born trailer, this conversation was quickly converted into a meme. But this line is way older than internet culture. This interaction repeats between the couples in the three other versions A Star Is Born, with slight variation. For example, in the first A Star Is Born (1937), Norman Maine (Fredric March), asks Esther Blodgett (Janet Gaynor) permission: "Do you mind if I take just one more look?" 3. Bradley Cooper cast his dog, Charlie, in the movie. Yes, that living bundle of auburn-colored, curly joy is Cooper's dog, who is also named Charlie. Cooper wanted the relationship between him and the dog to feel real. “Our characters [Jackson and Ally] don’t have a child together but they have a dog together, and I wanted it to be part of their story. I love dogs. That meant a lot for him to be in the film," Cooper explained to People. Cooper received a Compassion in Film Award from PETA for casting Charlie in A Star Is Born instead of casting a dog from an animal exhibitor. 4. Cooper also cast his own ear doctor in the movie. Dr. William Slattery, III, M.D. president of the House Ear Clinic in Los Angeles, probably never thought he would be in a major motion picture. Then, he met Bradley Cooper. 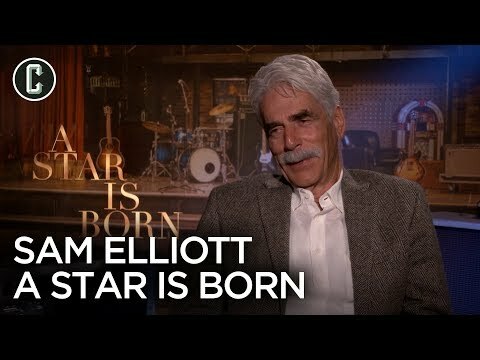 When writing the script for A Star Is Born, Cooper asked Slattery — his own ear doctor — to appear in the movie. 5. The drag bar scenes were largely improvised. Jackson Maine meets Ally while she's performing in a drag bar, a location chosen as an homage to Gaga's gay fan base. “I make a joke sometimes: behind every female icon is a gay man. I really wouldn’t be here without the gay community, what they have taught me about love and acceptance and bravery," Gaga said during the Toronto Film Festival. Many drag queens auditioned for the role – but when Lady Gaga found out that Shangela didn't audition, she contacted her directly. “Later I got an email from Lady Gaga’s camp and they were like, ‘LG heard you didn’t come in for the audition. She really wants you to audition. She wanted to see you for this role,'" Shangela recalled to Hornet. On set, Cooper told Willam and Shangela, the two drag queens and former Drag Race castmembers ultimately cast in the movie, to "go off and do your thing." Consequently, most of their on-screen interactions were improvised, including when Willam's character asks Jackson Maine to sign her breast plate. 6. A lot of thought went into the movie's tattoos. Ally doesn't have tattoos, but Lady Gaga definitely does. So while Gaga wore no makeup on her face, she actually had to wear substantial body makeup to cover up her Gaga-layer. Jackson Maine, on the other hand, does have a tattoo, though it's only visible in one scene. "We made it specifically for him," Neill told Refinery29. "I had [Cooper] draw it actually. Then, I sent it to my tattoo guy, printed it, and put it on." The tattoo is a reference to expression "Kilroy Was Here," which dates back to World War II. During the war, American GIs would scribble a cartoon face and the phrase "Kilroy Was Here" wherever they went. The tattoo is meant to be an homage to Jackson's father. 7. The movie was filmed at real music festivals — including Coachella. At Coachella 2017, Lady Gaga worked double duty. Not only did she headline the concert (filling in for a then-pregnant Beyonce) — she also shot scenes for A Star Is Born. To watch Cooper and Gaga perform together, festival-goers paid ten dollars and dressed in country-themed attire. “The scenes for these days will portray a Country Western music concert,” the announcement for the shoot read. “All you Monsters that can attend should get decked out in your most comfortable denim & boots, throw on a Stetson (leave those pink Joanne hats at home) and come out to show your support!” The ticket proceeds went to Gaga's Born This Way foundation. The movie also shot at Stagecoach and Glastonbury, two other massive festivals. The Glastonbury appearance had some A Star Is Born cross-over. Kris Kristofferson, who played the Jackson Maine equivalent in the 1976 version, gave Cooper and Gaga four minutes of his set at Glastonbury. 8. 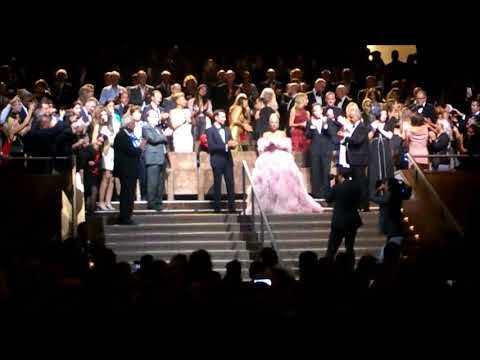 The movie got an eight-minute standing ovation when it premiered. 9. Barbra Streisand and Kris Kristofferson hung out on set. It was a passing of the Star Is Born torches. Barbra Streisand and Kris Kristofferson, stars of the 1976 version, spent a day on set. "[Barbra] gave us a blessing. Everybody was so excited she was there. We just looked at each other and were like, ‘Wow. How are we here right now?’” Cooper recalled to Entertainment Weekly. Streisand also invited Lady Gaga over to her house for dinner. 10. Ally hums "Somewhere Over the Rainbow" for a reason. While leaving her restaurant job early on in the movie, Ally hums "Somewhere Over the Rainbow." This is a subtle melodic nod to Judy Garland, who played Esther (the Ally equivalent) in the 1954 version of A Star Is Born – and, obviously, Dorothy in The Wizard of Oz. As she's walking, the movie's title appears in retro red lettering, another call-back to the older version's aesthetic. 11. Cooper and Gaga's first meeting was a lot like Jackson and Ally's. The first time Bradley Cooper heard Lady Gaga sing live, she was performing Edith Piaf's"La Vie en Rose" at a charity event. "My mind was blown," he told The New York Times. At the time of the performance, Cooper had been searching for a lead in his remake of A Star Is Born. He mentally cast Gaga. The next day, Cooper invited Gaga to his house to discuss the project. They sang "Midnight Special" by Creedence Clearwater Revival together, and a movie was born. 12. Like Jackson Maine, Cooper has a personal history with addiction. All of the male leads in A Star Is Born are haunted by addiction. In this way, Cooper can relate to his character, Jackson Maine. Throughout his 20s, Cooper struggled with an addiction to alcohol and painkillers. Cooper, now 43, got sober when he was 29. 13. Cooper modeled his voice off Sam Elliot's, then cast Elliot in the movie. If we learn anything from A Star Is Born, it's that Cooper is devoted to his craft. So devoted, in fact, that he spent 20 hours a week with a dialect coach to nail Jackson Maine's deep, car-wheels-on-a-gravel-road voice. Cooper modeled the voice off actor and director Sam Elliot. "I used was Sam Elliott because I didn’t want [Jackson] to be only a country musician and I didn’t want him to have an accent. Sam grew up in California and his mother is from Texas, so it’s kind of this great hybrid voice," Cooper told IndieWire. Then, Cooper recruited Elliot to play his character's much-older brother and manager in the movie. Elliot approved of Cooper's impression. "I didn’t have any tips at all, he already had it down," Elliot said at the L.A. premiere of the movie. 14. Cooper went tanning every day on set. For a guy who spends his days performing on stage, Jackson Maine sure looks like someone who spends his days riding a motorcycle without sunscreen. To achieve the washed-out, sun-drenched look, Ve Neill, the film's makeup department head, set Cooper on a tanning regimen. "I tanned him every day," Neill told Refinery29. "I had him do full-body [spray] tans every other week, then every morning I would re-tan him in the chair." 15. Who knew bathtubs could be a prime spot for makeovers? In the 1976 and 2018 versions of A Star Is Born, Barbra Streisand and Lady Gaga put makeup on their co-stars in while sitting in the bath. Streisand's Esther bedazzles Kris Kristofferson's eyebrows – yet another fixture of the movie's eyebrow fixation. 16. Aside from his dog and ear doctor, Cooper also cast the movie with his friends. A Star Is Born is chock full of references to Cooper's friendships. A mini Alias reunion took place — Cooper's co-stars on the ABC show, Ron Rifkin and Greg Grunberg, make cameos as his rehab group leader and limo driver, respectively. Cooper's friend from grad school, Gabe Fazio, also appears, as does Drena De Niro, Cooper's co-star from Silver Linings Playbook. Finally, Cooper cast his longtime friend Dave Chapelle in the movie. 17. Like Ally, Lady Gaga also faced pressure from industry professionals over her appearance. A Star Is Born highlights the pressures women face to change their image when getting into show biz. Before Gaga's first single came out, a record executive told her she should get a nose job. "I said no," she recalled during the Toronto Film Festival. Ally the character blames her nose (and general appearance) for her lagging career: "Almost every single person has told me they liked the way I sounded, but not the way I looked," she says. Jackson makes a point of loving her nose — it's a motif that runs throughout the movie. 18. The parking lot scene holds a bit of foreshadowing. In a video for the New York Times, Cooper explains that "the movie knows [Ally's] a star before she does." 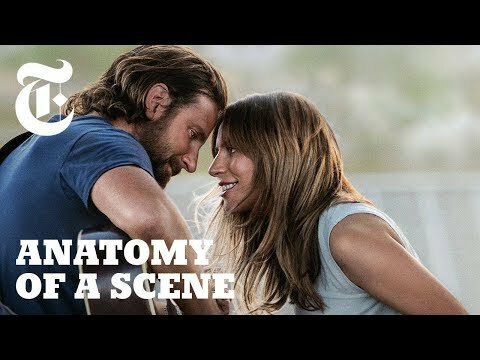 The parking lot scene exemplifies just how much A Star Is Born believes in Ally from the start. After Jackson and Ally first meet, they retreat to a parking lot behind a grocery store and essentially bare their souls to each other. Ally bursts into an early version of "Shallow," the song she wrote. Ally stands up and looks down at Jackson, as if she's on stage and Jackson an adoring fan. The store lights in the background lend to the scene's stage-y feel. Another hint of foreshadowing comes when Cooper's character drives by a certain billboard early on in the movie — but we wouldn't dare spoil it. “Lady Gaga and Bradley Cooper soar.” | Get your tickets to #AStarIsBorn now at the link in bio. 19. Ally's wedding dress is a nod to the '70s. The look was meant to emulate Barbra Streisand's aesthetic in the 1976 version.